Appliances like Lavazza expresso machines that heat water can build up lime scale. Heating tap water extracts the minerals from it and forms a white film inside the water tank. Descaling an espresso machine removes the mineral film and allows the coffee to flow freely into your coffee cup. Large buildups of lime scale will not allow coffee to flow and can be detrimental to your machine. Cleaning your espresso machine with a descaler keeps it in functioning properly. Turn the power switch to "Off" on the bottom rear right of the machine. Unplug the power cord from your wall outlet. Open the lid on the transparent water tank on the rear of the machine. Fill the water tank about 1/4 full with warm water. Add one packet of espresso machine descaler to the water tank. Mix thoroughly with a long wooden spoon. Close the water tank lid. Plug the power cord into an electrical receptacle. Turn the power switch to the "On" position. Wait until the LED display shows that the machine is brewing. Place a large cup under the steam wand and press the "Manual Coffee" button. Press the stop button before the liquid reaches the top of the cup. Pour the liquid out of the cup. Repeat this process until there is little or no liquid remaining in the water reservoir. Turn the power switch off and unplug the machine. Pull the water reservoir straight up and off the machine. Rinse it thoroughly with water and fill with clean water. Plug the machine in and turn the power switch on. Open the coffee pod holder lid. Place an empty coffee pod upside down into the holder and close the lid. Repeat Step 5 to empty the water reservoir. 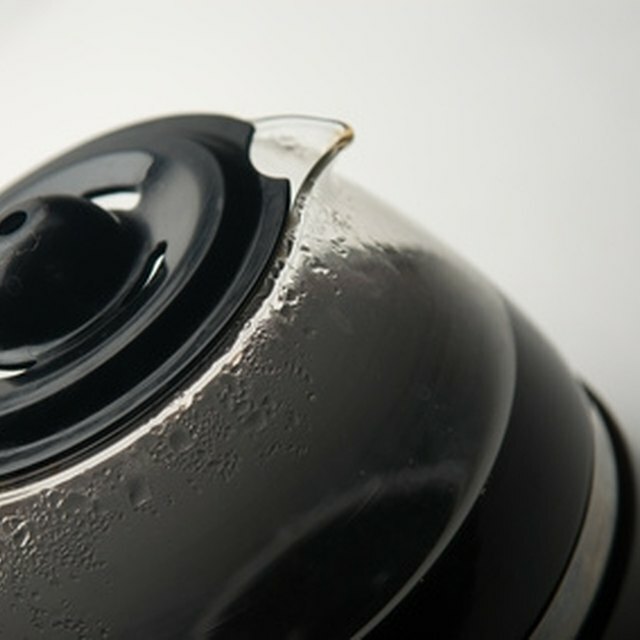 Placing an empty coffee pod in the machine during cleaning resets the display so it will brew and not just steam water.